We had some successful meals during August. I heard alot of yums coming from hubby’s mouth. Some of his favorites were the White Castle Sliders, spaghetti carbonara, and breakfast burritos. My favorites were the bowtie lasagna, White Castle Sliders, spaghetti carbonara, and lemon basil pasta. During early August, I made the spaghetti carbonara. Hubby absolutely loved it and ate the last of the left-overs. There was no way he was going to share. Two weeks later, I offered to make Sunday night dinner. I decided to make spaghetti carbonara. That time I got to eat the rest of the left-overs at work the next day. I had to stake claim on them right away or he would eaten them again. Chicken and cornbread dumplings (The $5 dollar mom’s cookbook pg 97) – I’ve been wanting to make this for a long time. I’m finally going to get around to making it. This post has been linked up to This Mommy Cooks and Mommy’s Kitchen. The Imaginative One has been working on taking pictures. These were taken at the Columbus Zoo. I am in absolute love with the polar bear, penguin, and flamingo shots. Come back next week for more pictures taken by the Imaginative One. This post is linked up to Menu Planning Monday at I’m an Organizing Junkie. MJ, one of my family members, got this interesting sheet that lists different ways to season food without using salt. As we are becoming more diligent with making sure things are low sodium for my father-in-law, I thought it was appropriate to post this list. I’ve decided to do a series of posts about different books that I enjoy either reading or listening to on CD. Some are adult series while others might be a children’s series. One of my favorite series is the Hannah Swenson series. It’s a murder mystery series that involves Hannah who owns a cookie shop in Lake Eden, Minnesota. Hannah is famous not only for her baking skills but also for finding dead bodies which drives her mother, Delores, batty. With the help of her sisters, Michelle and Andrea, her cookie shop partner, Lisa, and one of her two on-and-off boyfriend, Norman, they track down the killer. Her other on-and-off boyfriend, Mike, does not always like her investigating these murders. In some of the books, Hannah finds herself in some very tight situations which leaves the readers wanting to read more because they want to make sure everything is okay with Hannah. An added bonus to the entertaining books is the recipes, Joanna Fluke provides for the readers. They range from cookies to casseroles or hot dishes as they are called in Minnesota. I have tried some of the recipes from her books that are absolutely delicious. In fact, I have posted two of the recipes – Pretzel chocolate chip cookies and Watermelon cookies. I have read all of the books and several of them numerous times. I hope you enjoy the series as much as I have. A few weeks ago, I had a MOP’s party that I was going to attend. I knew I needed to bring some sort of party food to share with everyone. At first I thought about bringing brownies but when I got home from work that evening I decided I was not in the mood to bake so I went onto the Pioneer Woman’s Tasty Kitchen blog and try to find another recipe. I ended up finding a recipe for cookies and cream cheeseball. It sounded like something different and totally yummy. Once I tasted it, I knew I had made the right choice because it was deliciouso (my own made up word). I had some left-over so I took it to work and one of my co-workers even enjoyed it. My hubby even enjoyed eating this right out of the fridge with a fork. In a medium bowl, using an electric mixer, beat butter and cream cheese until smooth. Add vanilla, sugars and mix well. Stir in the Oreo cookie chunks. Then form a ball, roll the ball in the Oreo cookie crumbs. Place on a waxed paper lined plate and drape the ball loosely with plastic wrap. For more great recipes, please visit Potluck Sundays, Kitchen recipe swap, Delicious Dishes, and Tempt My Tummy Tuesday. Usually I’m not a big oatmeal eater, however; when I saw this mix on Mommy’s Kitchen I decided I needed to try it. Oh my goodness, it’s a lot better than the instant oatmeal you get at the grocery store. I think I like it because I can add what I want to it so it’s unique to my likings. Mix all of the ingredients together and store in a airtight container. Label the container with the directions on how to prepare the oatmeal. Scoop 1/2 cup oatmeal into a bowl and mix with 1/2 cup water. You may need a bit more water if you like you oatmeal thinner. Microwave on high for 1 minute stir and enjoy. Three weeks ago, the family and I went to a local historical park. The Wee One decided to bring along his stuffed monkey. We had a lot of fun posing the monkey at various exhibits. A favorite was lemon-basil pasta. It was my favorite meal during the week. My hubby enjoyed it but not as much as I did. The boys were not so keen on it but it was because it had green in it. My hubby’s favorites were the meatbball sub, breakfast burrito, and the barbecue ham. I was nervous about making the breakfast burritos for hubby because I didn’t know if he would like it or not. He ended up eating two of them! 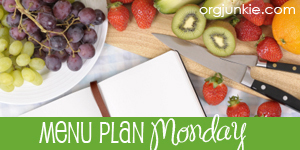 For other great menus, please visit I’m an Organizing Junkie for Menu Plan Monday. I found this recipe on The Pioneer Woman’s website. Since I had put some lemon chicken in the freezer, I decided that this would really compliment the chicken. The pasta dish is pure heaven. Okay maybe not pure heaven. However, it was delicious and the smells coming from cooking it or even heating it up makes me happy. In fact, I took it to work for lunch and one of my fellow teachers complimented me on the smell of the dish. If you get a chance, make this dish and escape to happiness from the taste and smell. In the same pot, melt butter over medium heat. Pour in cream and half-and-heat. Whisk until hot. Dump in cheese and whisk until melted. Add salt, pepper, and basil. This recipe is great as a side dish or eaten by itself. For other great recipes, Potluck Sundays, Delicious Dishes , and Tempt My Tummy Tuesdays.